I buy a pack of these occasionally just because it is so easy to give them to my kids for recess and they seem to like them. I’ve tried these fruit snacks myself and totally understand why my kids are obsessed with them! They are a little sweet for my taste but work perfectly for my children! Kids and is adults at home love these. Super yummy snack. They usually come with a magnet or stickers in the box which I love too. My kids like to have these. I find them to not work out to be really a cheap treat. We buy them only if they’re on sale. 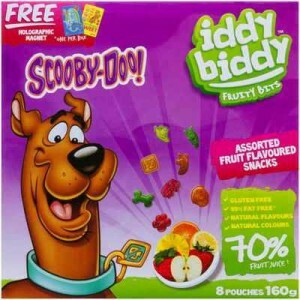 How would you rate Hotshots Scooby Doo Iddy Biddy Fruit Snacks?